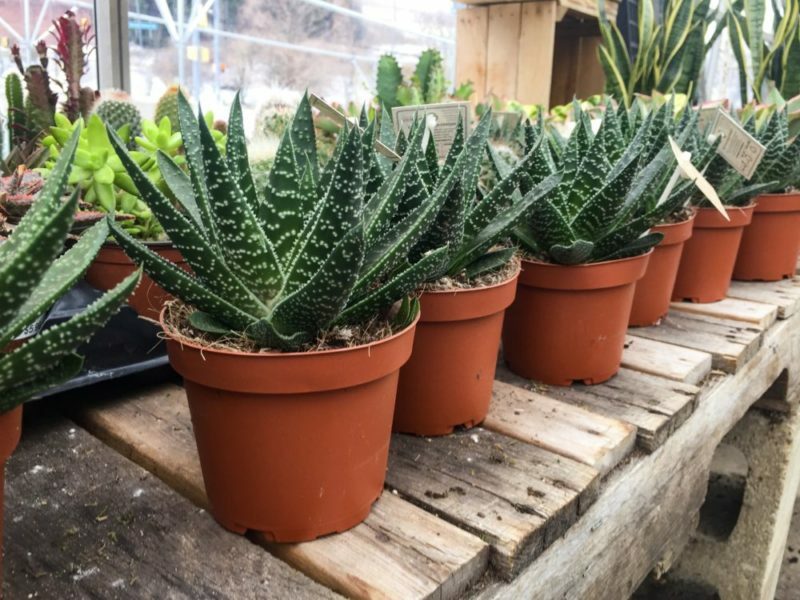 Stop into the Garden Center – located in the beautiful glass greenhouse next to the parking lot. We carry the plants – and everything else you need – for gardening success. Whether you are a budding beginner or a seasoned green thumb, our friendly, knowledgeable staff works hard to serve each customer’s specific needs, making sure they get the right plants along with everything needed to see those plants thrive. Brighten up your winter with houseplants! We take pride in our dynamic selection of houseplants. If you are looking for a little bitty succulent or a 6 feet tall tall fiddle leaf fig, or anything in between we can help you out. Looking for something specific? Let us know and we’ll do our best to get it in just for you. We have annuals and tropicals for every growing condition including, sunny, shady, dry, wet, and even deer resistant. All of our perennials are certified to be hardy in Zone 5 or lower, and include selections for all growing conditions. We offer a wide variety of herbs during the growing season that includes standard favorites, as well as more unique selections. We carry a wide variety of tomatoes, sweet peppers, hot peppers, egg plant, cucumber, zucchini, rhubarb, horseradish root, cole crops and more! In addition to our fruit trees, we also carry blueberries, strawberries, raspberries, blackberries, and more! Our shrub selection includes flowering and non flowering shrubs of all shapes and sizes, suited for a wide variety of growing conditions. All of our shrubs are certified to be hardy in Zone 5 or lower. We carry trees guaranteed to be hardy in our climate (Zone 5 or below), including, ornamentals, evergreens, and fruit trees. We take pride in our ever-changing selection of houseplants that offers a plant for every home. Even if you have low light, or you are a forgetful waterer, we have a plant for you! Our selection includes, but is not limited to succulents, airplants, fairy garden plants, ferns, ivies, and tropicals. We have perennial groundcovers for a wide variety of looks and growing conditions. We offer the highest quality seasonal favorites such as daffodils, tulips, lilies, hyacinths, and hydrangeas for Easter, Mums in the fall, and poinsettias, cyclamen, and Christmas cacti during the holidays. Feel the need for seeds? The Garden Center offers a wide variety of seeds from three companies, specifically chosen by our growers to provide the best value to our customers. We only carry non-GMO and untreated seeds, including a diverse array of organic options.